As a refurbisher, I buy thousands of broken MacBooks from recyclers every year, fix them, and sell them. These computers are donated/sold to recyclers by academia, corporations, and government. I called the recycler I bought this laptop from to ask what was going on, and he was familiar with the issue. 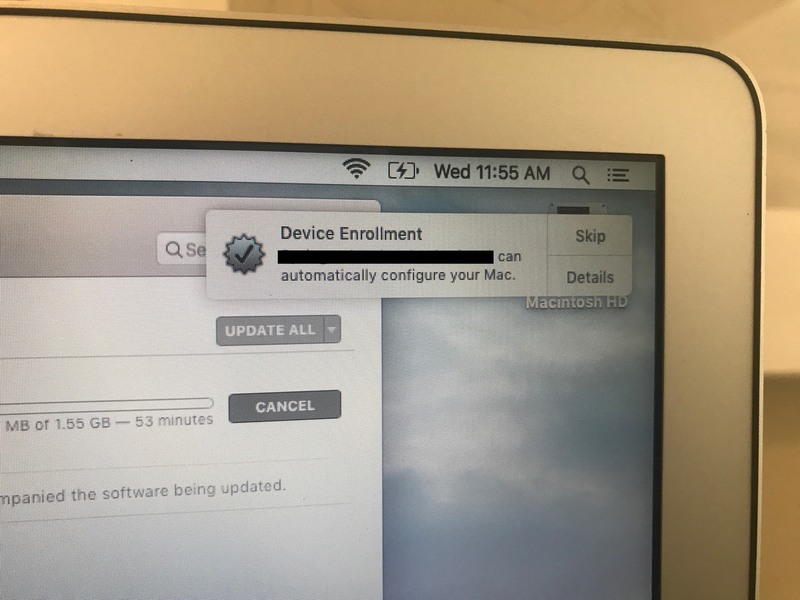 Apparently some schools and other organizations use an Internet-wide software deployment solution from Apple called DEP (Device Enrollment Program) — they register serial numbers with a management tool, and when a serial is detected on the Internet, the user gets a pop-up asking if they want the organization's software dumped to their machine. The user is also informed of this while stepping through the initial setup wizard. This way organizations can issue a new computer to someone, perhaps in a remote location, and simply by virtue of that serial number being registered, the user can be assured a full deployment of the company software. Handy and sort of cool, right? As I already witnessed, one problem occurs when the organization offloads computers to recyclers without de-registering them first. Perfectly good laptops that deserve a second life are plagued with pop-ups suggesting ownership — essentially a scarlet letter giving any reasonable person the impression that their laptop was stolen. The recycler explained to me that his many requests to de-register machines were unanswered, and that Apple also failed to help. I’ve since gotten confirmation of this reality from other recyclers as well. Without being de-registered from DEP, the logic board of the laptop is effectively bricked and can’t be sold. Most of them are therefore scrapped. So sad, I thought. Yet another way that thousands of perfectly good devices will end up destroyed and recycled instead of re-used, and as usual Apple fails to help. They’ve proven many times they want all their older machines put out of commission, so this is nothing new. But I started thinking — how exactly does a laptop, simply by having a “registered” serial number, start receiving these alerts? It must have something to do with the OS as well, since a serial number does not have a mind of its own, and computers do not automatically broadcast serial numbers. Good to know, I thought. I’ll add this to my checklist in order to avoid more embarrassing situations! Going with the idea that the OS is involved, I then wondered if ALL Mac operating systems do this check? Long story short, I tried setting up a registered laptop with every OS, and Yosemite and older do not produce this screen, while El Capitan and newer do. And also: I wiped the machines completely and installed a fresh copy of the OS, so I know this is not an instance of lingering “management drivers” or some other element that I forgot to erase. It's the serial number and the OS that triggers it -- that's all. You can bypass the screen by skipping the WIFI login (after which point you'll get the pesky pop-ups), but if you connect to WIFI and find out you have a managed computer, you're stuck. As a test, I walked through setup of a Sierra laptop, skipped the WIFI and iCloud logins, said "no" to location services and other requests to send information, and STILL got the popup instantly when I connected to WIFI from the desktop. The stubborn messages that my customer saw appear all the time, at regular intervals. 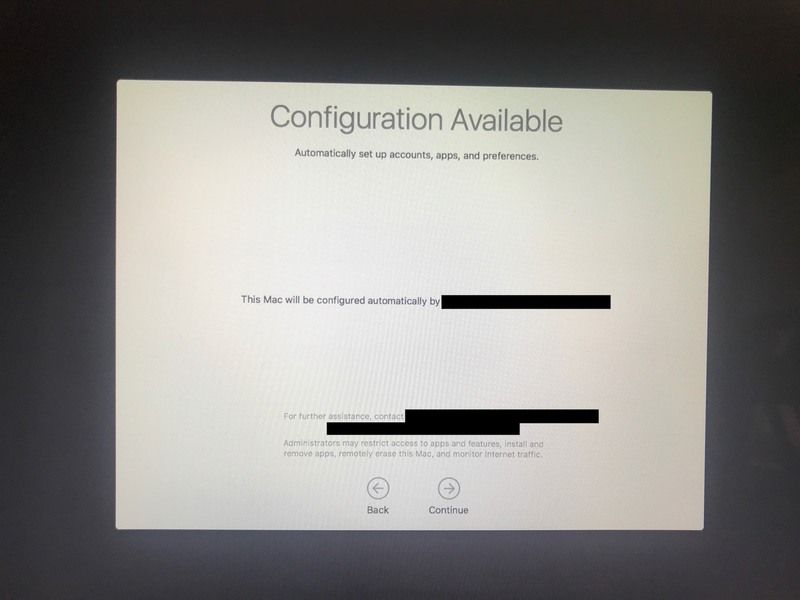 It seems pretty clear that if you have an Internet-connected MacBook with El Capitan or newer (pretty much everyone), Apple is likely checking your serial number against a database regulary. This struck me as scary, and probably an invasion of privacy. It seems innocuous enough on the surface, but if Apple is regularly checking your serial number against a database of managed computers, then what else are they checking for? What other databases are involved? Could they be recording location data, since most people have that turned on? And who gets to see this information? Apple is supposedly “big on security”, but courtesy of Edward Snowden’s findings, we know they participated in the PRIZM program, which essentially means an NSA network sniffer existed on Apple’s network, at least at one point. 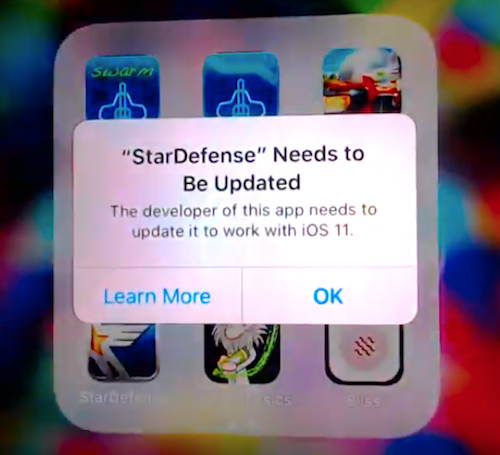 What gives Apple the right to do this? While setting up our computers we’ve all clicked past terms of service agreements, so it may be that we’ve given permission. But still, seeing what it means in action — realizing that your computer may be sending a periodic heartbeat to the mothership — is fairly alarming. I know this sort of thing is business as usual with phones, but aren't phones a different animal? We fully expect our phones to be permanently connected and a node on many networks, and for (mostly) good reasons. But with a laptop, shouldn't we have a right to be a solitary computer user connected to the Internet, without the leash of the manufacturer around our necks? I want to make it clear that I’m not an expert on this topic. Lawyers, technologists, and people who have actually read the terms of service agreements: Please tell me where I’m wrong. Is this something important? Is this nothing? Am I misinformed? Am I correct that our MacBooks are pinging Apple all day long? Please let me know — I want to flesh this out and realize whether I’m crazy or not. Hi! I’m John, and I’m writing in support of HF1138. I own a small unauthorized Apple laptop refurbishing business, and I have been in operation for ten years. I moved my company to Minneapolis from Chicago two years ago. Millions of perfectly good four-year-old laptops pass through the recycling channel every year, donated by government, academia, and corporations. Every year I buy thousands of broken laptops from these recyclers, fix them, and put them back into circulation. Previously I had been a corporate IT director, but I never felt good about what I did professionally until I started my repair business. Repair seemed like an occupation filled with hope and infinite possibility…what better thing could I do, after all — what greener thing, what more American thing — than start a business which essentially turned trash into gold? I have trained dozens of people to leave their corporate jobs and start their own repair companies. I have sold low-cost computers to individuals who were stunned to realize they could buy a fully working refurbished MacBook for $200 instead of $1500 new. Many parents are able to buy one laptop for each child instead of a single device for them all to share. But in recent years the scene has changed dramatically. I have witnessed tens of thousands of laptops destroyed by recyclers because they did not have access to the parts, tools, or knowledge necessary to fix them. I have witnessed tens of thousands of laptops destroyed because the donating institutions left them “locked”, and Apple would not unlock them or provide recyclers/refurbishers the tools to do it themselves. I have witnessed a decline in repairability due to integrated, non-replaceable parts and proprietary designs intended to keep owners from fully accessing their own devices. I have been subject to Amazon and Apple’s recent agreement to ban small refurbishers from Amazon — effectively erasing small business’ access to half the online retail marketplace, and putting several hundred companies similar to mine out of business. And as if all that wasn’t enough, manufacturers are working hard to fool us into believing that we are licensing the devices we buy rather than owning them, because a license grants us fewer rights. They want to prohibit us from doing repairs, and ultimately from even being able to sell the devices we own. They want us to believe that they have some kind of lingering, ongoing right to the devices they have sold us, but they don't! In short, the repair world — the world of small business, entrepreneurship, and environmental sustainability — is experiencing a full-on assault from manufacturers. Apple pays lobbyists to demonize small businesses like mine with marketing spin and fear rhetoric, telling us the real issues are customer experience and safety. But don’t be fooled — it’s about corporate profit. The net result of their actions will cause our ownership rights to further degrade. The net result of their actions will cause tens of millions of devices to be scrapped. When your laptop or phone breaks, they want you to give up the thought of repair and simply buy a new one instead. That’s all. HF1138 will not address all of these concerns, but it will send a clear signal and take a giant step forward. Just as already exists in the auto industry, those who repair devices will have access to the information and parts they need to work on products that they and their customers own. We all realize and accept that independent mechanics can plug into our cars in order to diagnose and repair them, so why on earth should it be off limits, and even potentially illegal, to do the same with our laptops and phones? It is the fog of technology, the confusion of licensing-vs-ownership, that causes us to doubt that we own our devices and therefore have the right to do what we want with them. But make no mistake: We DO have that right, and now we need to claim it. Paid lobbyists for the manufacturers hope they can fool you by whitewashing these issues, allowing their employers to further degrade ownership rights so they can make more money. I hope I can count on you to see through their tired arguments — please stand up for entrepreneurship, small business, a sustainable future, and our right to repair. If I can do anything to help, or answer any questions, please let me know. I’ve been selling MacBooks on Amazon for years, and I have a perfect feedback rating that I’ve worked hard to uphold, but as of today (January 5th), Amazon is prohibiting me and thousands of others from selling Apple products. I’m sure you’re aware that Amazon is cutting off small Apple sellers and refurbishers today because they don’t qualify for the “Renewed” certification (which requires sellers to prove they buy $2.5M worth of inventory a quarter). I’m not writing to complain about my own situation. Unlike hundreds of small Apple sellers who have gone all-in with Amazon and will have a very hard time adjusting, I’ve been in business for ten years and have diversified my customer base. I sell about a third of my inventory on Amazon, and another 20% to wholesale customers who also sell on Amazon, but if I shift my sales to other platforms, I’ll be OK. For now, at least. I can imagine why you made the agreement. Striking a deal with Apple in order to sell their products directly on your site makes good business sense, and it’s certain to be lucrative. As a large group of small sellers, we’ve made you many millions of dollars, but I doubt we can compete with an Apple partnership. Cutting out a large quantity of small sellers in favor of a handful of giant ones must certainly lower administrative costs as well. What I’m concerned about is this: While this decision is conceivably good for Amazon, there is a bigger picture. You have been so successful, so dominant in the space you occupy, that your company represents a full 50% of the total Internet marketplace. And so when Amazon decides to exclude certain sellers — small family businesses, mainly — a full 50% of the Internet’s total opportunity is suddenly unavailable to them. It’s Amazon’s right to do that, to make a business decision in agreement with another company. (And besides, there’s still 50% of the Internet left!) But what happens when Walmart makes a similar agreement with Apple? Newegg? Maybe eBay even falls into line, because certainly you’ve won over a big chunk of their customers and they need to compete. What happens when 70%, 80%, 90%, or more of the Internet’s total opportunity becomes unavailable to the average individual, to the beginning entrepreneur, to small businesses? How would you, Jeff Bezos, have fared if the Internet’s landscape looked like that in 1994 when you started selling books out of your garage? $2.5M in quarterly inventory may seem like a reasonable requirement to some, but most businesses just aren’t that big. Many independent, privately-owned companies only buy a tenth that much inventory yearly, and that doesn’t make them illegitimate. Not only that, but these small businesses are often the ones that repair and refurbish the electronic devices they sell, and put time into processing low-end computers, whereas the large companies you’re certifying generally don’t bother, and simply scrap low-end and broken electronics. Once the small business community is cut out, older products won’t be represented, and millions of Apple devices will be scrapped. Millions of perfectly viable low-end computers and phones and tablets will not find homes. Apple and Amazon will certainly drown out these concerns with the same old tired marketing spin and fear rhetoric, telling us it’s about customer experience and safety, but what it comes down to is that small businesses will die and perfectly usable electronics will go to waste. It’s bigger than that, even — it’s a question of what we want the Internet to look like. Whether it’s selling computers, speaking opinions, having a bank account, or offering a service, is it right that access to any given opportunity on the Internet should be entirely decided by two or three massive companies? That the average person, the individual hoping to be independent and start a small business, could be effectively locked out of the supposedly “free and open” Internet because of a decision between corporations? That’s where we’re headed, and that’s what has me worried. I don’t know what the answer is. Many believe antitrust regulation is the way to go, and it very well may be, but I would hope the same ingenuity that started the Internet, that championed a limitless new free and open space, would find a way to make it free and open again. I really hope that you have this issue on your radar. As one of the truly powerful people in the world, you have the capacity to make positive change. You have so much power that a good part of the future of the Internet, and the future of opportunity, and fairness, and other basic principles in our society could very well rest on your shoulders. Jeff Bezos, please tell me that we can rely on you to do the right thing for the interests of the world, and not just the right thing for the interests of your company?